Landlord Diaries » Blog Archive » To Swim Or Not To Swim! To Swim Or Not To Swim! 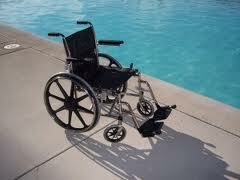 I remember it was a hot summer day in August and we had this one resident that was confined to her wheelchair. The community room had a huge picture window that had this dynamic view of the swimming pool. 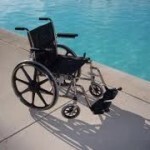 I just happened to glance outside and the resident that was wheelchair confined was attempting to get into the pool. Nothing was going to stop her. She was bound and determined. Our poor lifeguard was just beside herself, realizing the liability this resident was creating for her. Of course the resident was getting upset because our lifeguard would not accommodate her desire. Needless to say, she managed to get into the pool and bobbed around for a few minutes and we had to call 911 to pull her out. What extraordinary measures we take to cool off and be the center of attention!!!!!!!! « Glass of Wine Anyone??? This entry was posted on Monday, April 18th, 2011 at 9:11 pm	and is filed under For Shits and Giggles!. You can follow any responses to this entry through the RSS 2.0 feed. You can leave a response, or trackback from your own site.